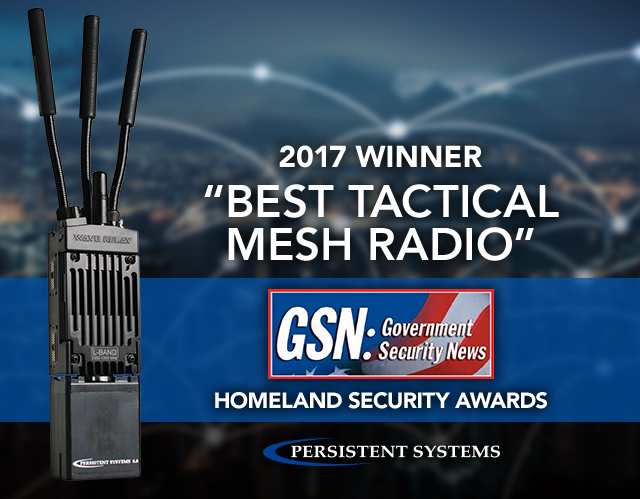 Persistent Systems, LLC (“Persistent”) is proud to announce that GSN: Government Security News has honored the company with a coveted 2017 Homeland Security Award (“Best Tactical Mesh Radio”) for its handheld MPU5 radio and Wave Relay® mobile ad hoc networking (MANET) solution. In contrast to other systems, the MPU5 acts as both a receiver and relay station—creating a scalable, secure, self-healing, high-speed IP network that operates on the move, enabling the exchange of voice, video, text and sensor data, all without the need for external communications infrastructure. Video footage collected from cameras. In addition, the MANET radio has an HD video encoder/decoder for high-throughput transmission of video feeds and a 3×3 MIMO radio to provide unparalleled performance in underground tunnels and urban canyons. To facilitate operator flexibility, the MPU5 has a Radio-over-IP (RoIP) capability that allow users to tether third-party legacy radios into the wireless IP network. The MPU5 is also modular in design, so operators can switch between RF bands (L-, S-, and C-Band) in support of the mission. Considering all these capabilities, “the MPU5 radio from Persistent Systems was an easy choice for Platinum Winner in the category of Tactical Mesh Radio,” said Government Security News publisher Chris Zawadzki. Besides military customers, the MPU5 is used by a wide variety of federal, state, and local agencies, including Department of Homeland Security components, the Department of Justice, and New York Police Department, said Nick Naioti, VP of Business Development. “The MPU5 radio has tremendous momentum in the market because more and more agencies are realizing what our Wave Relay® MANET technology can do to support their mission,” Naioti said.